Providing you the best range of industrial ribbon blenders, chemical powder blending machine, ribbon mixer and steel ribbon blenders with effective & timely delivery. With the help of our experienced engineers, we are able to manufacture, supply and trade high quality Industrial Ribbon Blenders. The range made available by us is manufactured using high quality material so that it is in tandem with international quality standards. To meet the variegated requirements of our esteemed clients, we offer these products in various specifications. 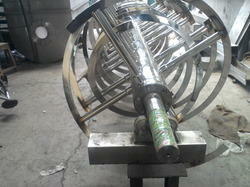 We are offering Ribbon Mixer Machine. 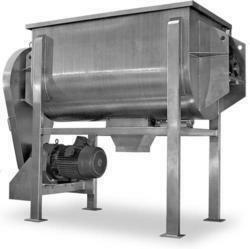 Ribbon Mixer is primarily designed for use with dry materials, although gas and liquid streams can also be added. 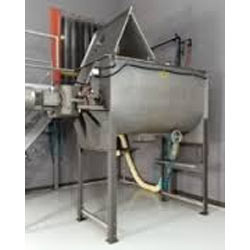 A wide variety of configurations, for either batch or continuous mixing, are available with sizes ranging from 100-20000 liter working capacity. Application specific rotor mixing element design allows shorter batch cycle times due to increased mixing efficiency. 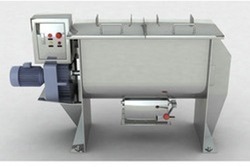 We can customize the design of the Ribbon Mixer to meet your specific mixing requirements. Mixing vessels can be standard U-shape or cylindrical depending on internal pressure or vacuum requirements. Owing to our rich industry experience, we are manufacturing, supplying and trading Steel Ribbon Blenders. All the offered products are manufactured under the strict surveillance of highly experienced professionals. Our experts do not compromise with quality and make sure to use excellent quality material in the manufacturing process.